University Archives | The Loyolan, 1970 Phoenix staff members and writers gather for a photo in 1970. Walsh (bottom right), Possley (back) and Novak (second from left) pictured with other reporters. Today’s PHOENIX editors often joke about the paper rising from the ashes, but that sentiment is precisely why the name was chosen when the paper originated in 1969. “Out of the ashes of the old would come forth a new bird,” wrote the inaugural editorial board of The PHOENIX in September 1969. Christopher Walsh and his staff rebirthed The PHOENIX “from the ashes of the Loyola News” to bring a voice to the student body and the greater Loyola community. 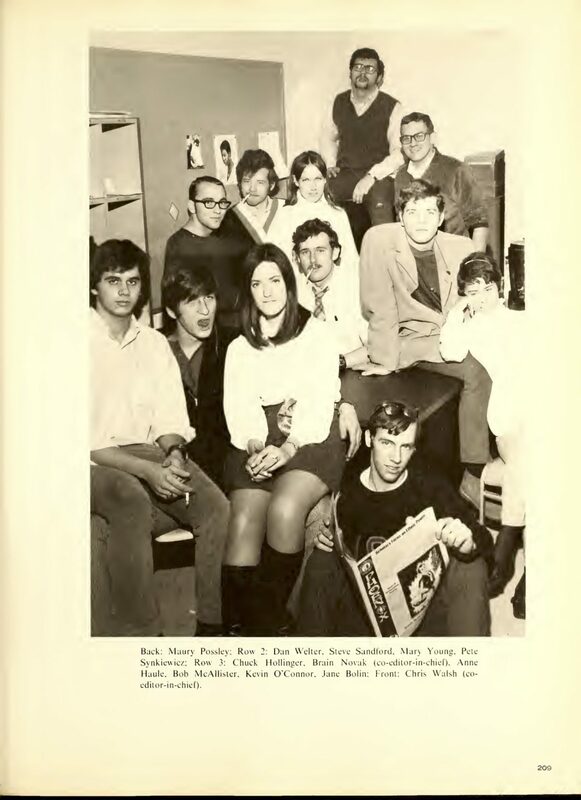 In 1969, Walsh and Brian Novak, who died in 2005, were appointed editors of the then-Loyola News. The majority of the Loyola News staff left the publication because they disagreed with the administration’s ability to appoint editors. 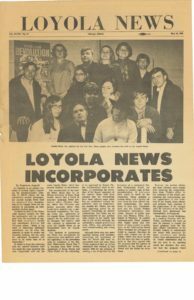 The old staff members left to try their hand at a not-for-profit newspaper, Loyola News, Inc., which published only one issue. Walsh, thinking the old name was bland and unoriginal, suggested “The PHOENIX” to symbolize a new beginning. Walsh and Novak hired a new staff, officially changed the name, and The PHOENIX was born. Now a property tax lawyer in Chicago, Walsh said he fondly remembers the early years of The PHOENIX, referring to himself and his staff as “rabble-rousers” who wanted to shake up campus culture, bring new voices to the paper and reform university policies. 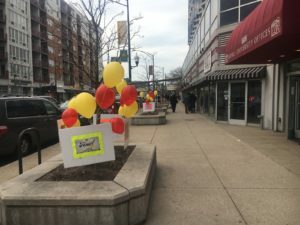 During his time at Loyola, Walsh was involved in Loyola Student Government Association and Committee Without a Name, an organization which advocated for large-scale change to campus policies. “I was different than a lot of editors-in-chief in that I was not only overseeing the reporting of university events and activities … I was part of them, I was part of the things that were happening on campus,” Walsh said. Contrary to modern student journalism, Walsh said he didn’t receive criticism for being involved in campus affairs because he didn’t report on the activities he was involved in. Walsh said one of his goals as editor was to bring forth wide-ranging opinions to the publication through columns. Walsh encouraged columns from the dean of students at the time, Wayne Tinkle, and “From the Right,” a column from a conservative student to counter the generally liberal leaning tone in the opinion section. The paper’s beginning issues, published each Friday, ranged from 12 to 16 pages. Walsh said he and Novak struggled to find a staff in the beginning, but they used their connections with different types of students — Walsh in student government and Novak in Greek life — to gain writers and staff members. Martin Glista, who worked under Walsh during The PHOENIX’s first year and eventually became its third editor-in-chief, said Walsh was an “open-minded” editor and trusted his staff. Glista said The PHOENIX staff bonded in part because of Walsh’s role as editor-in-chief. “He’s a great man, I think that a lot of the camaraderie and enjoyment that we all experienced from being on The PHOENIX was in large measure due to his leadership and his own personality and good will,” Glista said. 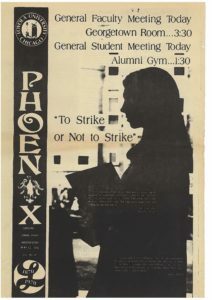 Coverage in The PHOENIX’s early years included a student strike in May 1970 protesting the Vietnam War and changes in university policies, such as discrepancies in residence hall policies dependent on gender, which parallel the current push by student organizations to remove all gendered language from residence hall guest policies. 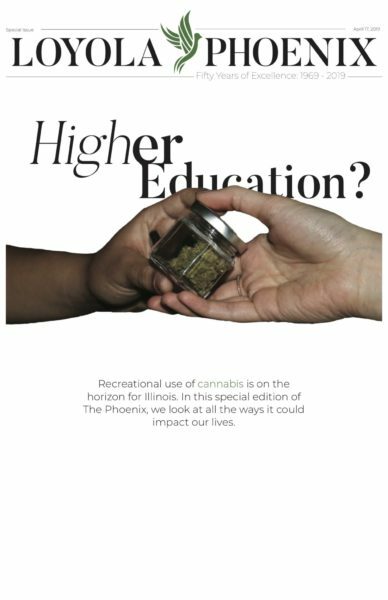 The PHOENIX published a special issue with coverage completely dedicated to the student strike, Walsh said. A ban on the possession of handguns was passed in Oak Park in the spring 1984 elections, Possley said. Possley, who’s worked as a reporter at the City News Bureau, the Chicago Sun-Times and the Chicago Tribune since his time at The PHOENIX, said Walsh was motivating as an editor and wanted his staff to use its own voice. Glista, now a retired lawyer living in Michigan, said Walsh had a critical way of thinking as an editor. “Most of what I remember of Walsh was his habit of twisting the corner of his ridiculously thin boyish mustache while he pondered matters ridiculous and sublime,” Glista said in an email to The PHOENIX. Walsh, sporting a less-boyish mustache nearly 50 years later, said his experience with The PHOENIX made him a better leader. After serving as editor-in-chief, Walsh went on to earn his law degree from New York University. In his last column, he wrote a farewell to the paper and its staff. Walsh gave an overview of his last column with hints of tears forming in his eyes. “It basically said thank you to everybody … for teaching me what you need to learn before you go,” Walsh said. Correction: An earlier version of this article stated James Piszczor was killed in a courtroom in Oak Park. He was shot and killed in the Daley Center.